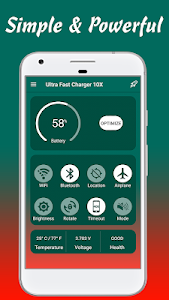 Ultra Fast Charger 10X is a NEW and FREE battery fast charging application with Battery saver that provide a great support to your Phone with complete battery information that help you kill all the background processes just with single click. 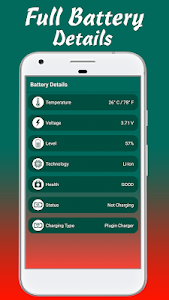 This amazing battery charging app helps you scan all services that are consuming phone battery including Bluetooth, GPS, Wi-Fi, Mobile data, High screen brightness, Screen timeout. 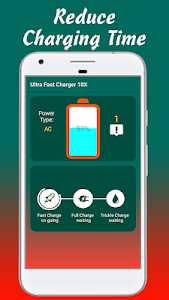 Ultra Fast Charger 10X helps you solve battery charging problems and extend your battery time up to 50% without paying any fees or special memberships. 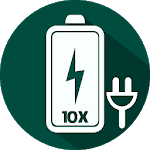 ▶ Fast Charging 10X technology charge smartphones very fast and in few minutes than before. 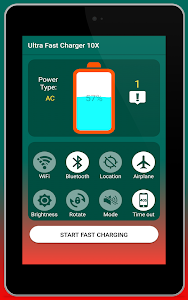 Fast battery charger reduce your charging time up to 30-50% and your mobile phone charged fully just in 30-50 minutes. ▶ Our app is very easy to use and there is no complex process. Just download and install it for Free on your android Smartphone or tablet. Tap the optimize button and we will take care of the rest. It’s all. 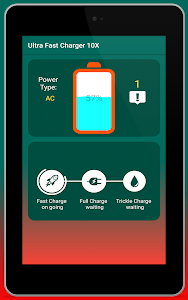 ▶ Once you install our app you will benefit from our fast and smart charging feature that will help your phone to be charged super fast. You will see a big difference between charging your phone with and without Ultra Fast Charger 10X. 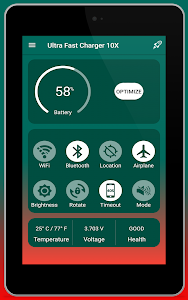 ▶ Inside the "Battery Details" section of our optimize battery app you will be able to see the percentage of battery energy as well as Temperature in Celsius or Fahrenheit, Level, Status, Voltage, Health of battery and finally the Charging Type. 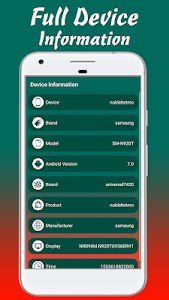 ▶ In the new screen "Device information" you will be able to see all the information you need to know about your Phone, System and hardware with attractive and beautiful user interface. 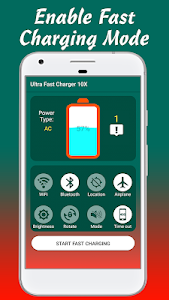 ▶ Ultra Fast Charger 10X not only improves charging time but also extends your battery time. To keep running fast charger in background press 'home' button. 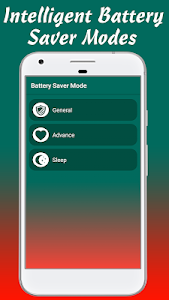 ▶ Once you activate our longest battery life app, you don’t have to touch it again, because it runs in background and automatically. 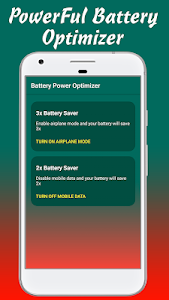 We will save your battery without opening our app. ▶ The best thing in our longer battery life app is that you can use it for Free without paying any fees or special memberships. Enjoy it for Free! - Nice and User-friendly UI. - Easily activate or deactivate Wi-Fi network, Bluetooth, Location, Airplane Mode, Brightness, Rotation, Sound and Timeout. - Shows the Battery Capacity & Details in the app. - Shows Full Device Information in the app. - Notification when Battery full charged. Please contact us via email at ([email protected]) or via our facebook page ( https://facebook.com/ATA-Droid-203617193441113/ ) to give us feedback and any suggestion about our app. 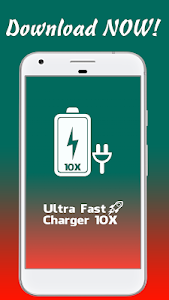 Similar to "Ultra Fast Charger 10X"